The numbers are set in a way that do not correspond to neither the clock arrangement nor a standard phone keypad. 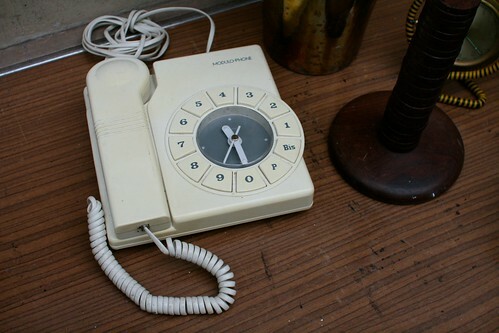 To some extent, there is a mismatch between the mapping of the phone numbers (from 0 to 9 with a Bis and I do not know what P stands for) and clock numbers (from 1 to 12). Down the road, this interface is not very meaningful to the user. The design decision to use the clock analogy as a phone keypad (arranging the number all around the circle) is simply wrong. Even tough it looks curious, you should definitely not look at the numbers if you want to read time. Why do I blog this? rationalizing the discussion I had with Julian while visiting the flea market. A great place to collect insights about design decisions. Moreover, this is an interesting example for Basile's research about cultural elements circulation that you can find in the following poster and a forthcoming article entitled "Redesigning Culture: Chinese Characters in Alphabet-Encoded Networks" at Design and Culture from Berg Publishers.